Ruud Cornelissen · CD "Short racking"
Ruud Cornelissen keeps it short: on his cd Short Tracking there are no less than thirty Jazz Rock miniatures. Cornelissen has been educated as a clasical doublebass player and played for many years in the Radio Symphonic Orchestra in the Netherlands. Next to this he plays the bassguitar and he is active as a bass instructor. Fusion freaks probably know his son Sebastiaan, who explores the adventurous side of the jazzrock with projects under his own name. Sebastiaan participates on the cd together with a couple of other hot shots like Rob van Bavel (Fender Rhodes), Frans Vollink (fretless bass) and Marc Guillermont (guitar). We are sold just by seeing the cd cover: an oilpainting of a skating rooster on a frozen pond with a bass guitar around his neck. 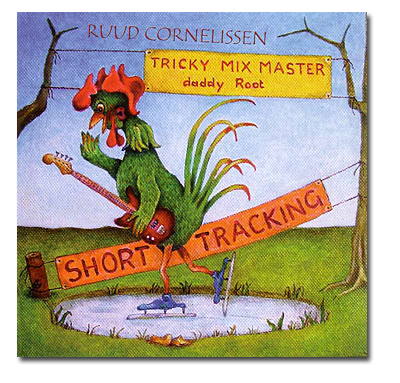 Cornelissen's short rounds on his skates are sometimes no longer than two minutes, but are all perfectly finished entertaining short songs. It is fantastic to hear how he can integrate diverse bass sounds in his compositions. Sometimes we hear whole clusters of low tones: bowed double bass and bassguitar chords, that are smartly arranged not to form undefined noise. As a classically schooled double bass player, Cornelissen plays clean melodies, but he knows how to play the bassguitar as well. The sounds of his five string Sandberg remind me of Anthony Jackson: deep and clear tone, as if they were played with a pick. Both in his composed melodies, as in his supporting role and in his solos, Ruud has a characteristically, square approach. The notes pass you by in a strict regularity, like road markers on a straight road. Do you want a totally original, fresh bass record, from an unkown hero, then order this cd. Here is a tribute to Tobias, from this CD "Short Tracking". Hope you'll enjoy.